The Black Sea has a great potential, since it's anoxic (anaerobic, no oxygen) below c 200 m depth. With no oxygen, deep-sea wrecks can be preserved for millennia. At the end of last Ice Age, global warming flooded Lake Agassiz in present Canada, raising global sea levels and flooding the Black Sea, sometime 5500-5000 BC. Remains of settlements from the time before the flood have been found underwater. Mesolitic settlement. This stone-age settlement was found in 2000 by the Robert Ballard team. Named "Site 82", it is located on 95 m depth north of Sinop on the Turkish coast. Wooden beams and branches are laying intact on the site. The settlement must be from before the flood, thus at least 7000 years old. Bulgarian log boat. During the summer of 2001, Bulgarian trawler fishers caught a log boat from c 120 m depth (partially anoxic depth) near Sozopol. It was dated to c 4000 BC. This find is possibly connected with a Stone Age settlement that was found underwater in the Sozopol Bay 15 years previously. Ref Metro, Stockholm, 4 September 2001. Greek amphora wreck, Bulgaria. Located in 2002 on 84 m depth by a joint U.S.-Bulgarian research expedition, headed by Robert Ballard. The ship was a Greek merchant ship from 5th-3rd centuries BC. No preserved wood is visible above seabottom, but a large amphora from tha cargo has been investigated – it contained fish. Link. Shipwreck A. Discovered in 2000 by the Ballard team. The site is north of Sinop off the Turkish coast on 100 m depth. This is deep enough to be undisturbed by fishing nets. Also this depth has so little oxygen that no organisms eat the wood. The wreck is Late Roman, 23 m long, loaded with amphoras. The hull is broken but several large ship timbers are preserved on the sea bottom . Shipwreck D. This ship, as well as others, was located in 2000 by Robert Ballard's team. It lays very well preserved on 320 m depth. Radiocarbon dated to 410-520 AD. Frame ends stick up from the dead bottom sediment, indicating that an intact hull is embedded in loose sediment. The mast is still standing, 11 m tall. The hull is about 12-13 m long and 3½-4 m wide. The ship remains to be investigated. The photo by Robert Ballard is made from an ROV. Ref New York Times, 3 November 2000. 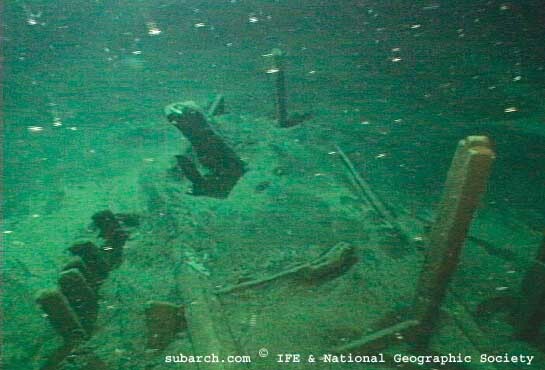 13th century shipwreck at Soldaya, on 12 m depth, investigated since 1999 by University of Kiev. Some suggest that this "flood" was violent, and perhaps origin of the Biblical Flood. However, Professor Emeritus Eric Olausson, Gothenburg University, says that the Black Sea was indeed a separate sweetwater lake. At the end of the Ice Age, melting ice raised the global sea levels so much that the Mediterranean finally reached the Bosporus, and started leaking in seawater, very slowly. Perhaps the filling started 9000 BC and ended 5-3000 BC. Since then, the Black Sea has had its present sea level, perhaps 150 m higher than the old level (Ref: Populär Arkeologi 4/2000). You can read on Wikipedia.